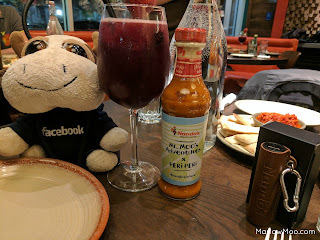 Nando’s recently opened a new location at Richmond Garden City and I was invited to come check it out. 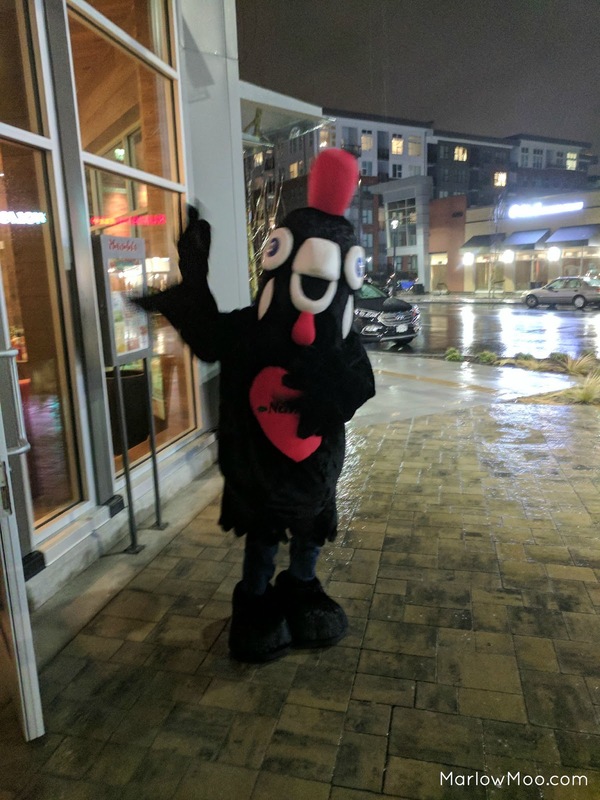 I’ll have to admit, being from Edmonton, I’d only been to Nando’s once before, and that was last winter when they opened their first location in Edmonton and invited Moo to come celebrate their opening. Although I’d seen Nando’s while visiting the UK previously, I’d never actually gone in, though I had heard friends talk about it. Nando’s has actually been in Vancouver since 1994, although they will be the first to admit that very few people seem to be aware of them. For those who don’t know what Nando’s is, they are a casual restaurant that focuses on flame grilled peri-peri chicken, with a Portuguese heritage. Started in South Africa in 1987, they are found all over the world, including here in Canada. I have to admit that I didn’t write about the opening in Edmonton, mostly because the event was sort of crazy, as it was open to both media and the public. In Edmonton, it was dead of winter, a line up out the door, and I honestly didn’t feel like they did a good job of showcasing Nando’s. Compared to the launch of their Richmond location, the events were night and day. Since the restaurant was located in Richmond, they arranged for transportation to pick up those of us who live in Vancouver at the Rosewood Hotel Georgia. From there, we boarded a party bus which drove us to Richmond City Garden, where we were greeted by Nando’s mascot, Barci. 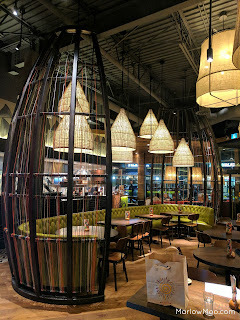 Each Nando’s restaurant design is unique, with this particular Nando’s being large and airy, with lots of bright colours and funky artistic touches everywhere. Artwork adorned one wall near the back of the restaurant, and we learned that all the art in all 1,200 Nando’s worldwide are one of a kind and different. Nando’s sponsors a range of programs in South Africa to help emerging artists further their development and purchases pieces from many of these artists, which are then sent to their restaurants around the world to be displayed. 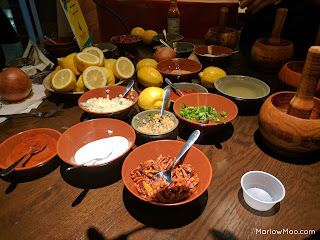 Although there were other food bloggers who had been to Nando’s quite a bit, even they did not know this. Given some people’s aversion to chain restaurants these days, I think Nando’s needs to advertise and capitalize on this a bit more, as I think it would make them seem less "corporate" to people who think chain restaurants have no soul. So remember next time you’re at a Nando’s elsewhere in the world that the art you see on the walls can only be seen there! After being plied with sangria, garnished with the largest strawberry I had ever seen, we participated in a peri peri making contest, judged by Ron Cecillon, President of Nando’s Canada. My table mates for the evening were, Meg Gill, associate editor of 604Now and Brodie Marples, an actor, dancer and singer, who joined me and the humans in trying to make peri peri. 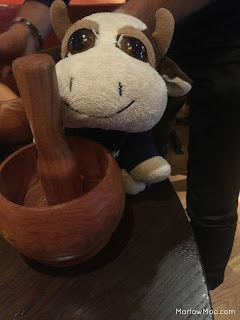 It turns out it’s a lot harder than it looks to figure out the right proportion of ingredients, then to use a mortar and pestle to grind the ingredients down until it actually looks like a sauce. Mine wound up being super spicy, chunky looking salsa, whereas Meg was able to get something that actually resembled sauce and Brodie managed to place in the top 5! The secret behind the peri peri sauce is the African Bird’s Eye Chilli, whose unique flavour comes from the terroir of Africa. I have to admit that I’m a bit of a spice wimp, so a little peri peri sauce went a long way with me. Thankfully we finished the evening with something sweet, Portuguese egg tarts! 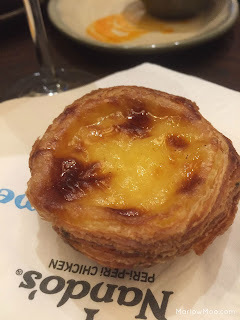 I love Portuguese egg tarts, which are similar to a Chinese egg tart, only the tart shell is made with a buttery phyllo dough and the tart is broiled to caramelize the top. 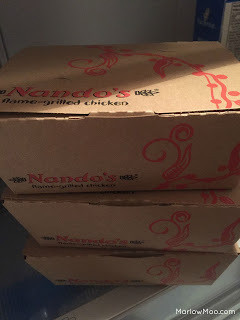 We certainly did not lack for food or drink that evening, as they also sent everyone home with boxes of chicken, personalized bottles of peri peri sauce, as well as other goodies. By the end of the evening, I wished every restaurant opening I’d been to was as much fun as Nando’s had been. We ended the night watching Brodie and Pam Jacques, Marketing Manager of Nando’s Canada, dancing on the party bus as it drove us back to Vancouver. Honestly, this was the most fun and well run opening I had been to, possibly ever. Now, I know you all love contests so I have one for you! You can win a $25 gift card and an influencer kit from Nando's Canada! To enter, you MUST leave a blog comment answering the question “What’s your favourite chicken dish?” to be eligible to win. UPDATED Saturday, February 4, 2016: The contest is now closed. Thank you to everyone who participated! The winner is Maria! Congratulations and I hope you enjoy your Nando's gift card and influencer kit! For those of you who live in or around Vancouver, Nando’s will be celebrating the Lunar New Year on Saturday, January 28 and since it’s the Year of the Rooster, they will be giving the first 100 people who arrive after 11:00am at the Nando’s Richmond Garden City location a free quarter chicken meal including Nando’s peri peri fries and a Coca-Cola Freestyle beverage. For everyone else, if you’ve never been to Nando’s, go check them out! The chicken is anything but boring and the Portuguese egg tarts are moolicious! Chicken tikka masala, extra hot! I've never actually been to Nandos but all my friends are raving about it and you make it sound pretty tasty. Can't wait to try it! I've never actually been to Nandos but all my friends are raving about it and you make it sound so tasty! Can't wait to try it out! I usually like my chicken bbq'ed with rice or salad on the side. I prefer my chicken hot. 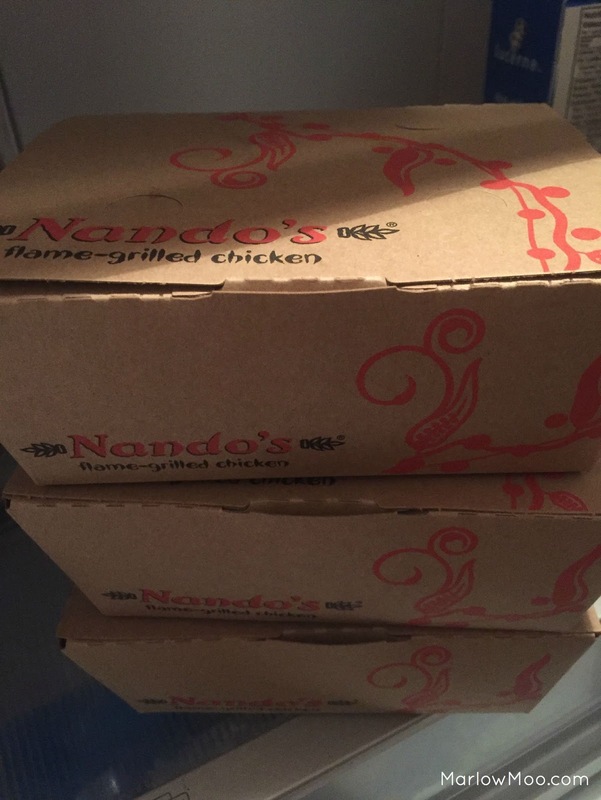 I have never tried Nando's chicken before, but I would love to!